I’m gonna level with you about something; I am not a great housekeeper. I try to keep clutter to a minimum and “straighten as I go” but the actual CLEANING thing? I don’t know but I think it must have skipped a generation. I remember watching my mom vacuum the floors and wash the dishes (by hand much of the time) and scrub the bathrooms. And sure, I have done those things…..before. Thankfully for anyone who comes to my house, my husband is a GOLD STAR CLEANING MACHINE. He’s a scrub on your hands and knees and get the corners with a toothbrush kind of guy and for that I love him. But it also shows a big difference in the way we see dirt. I don’t want to be dirty and I am learning to really see the dirt. With a little one (soon to be 2) running around, I need a better system. When I saw the opportunity to review Heather Solos’ book, Home-Ec 101, I jumped at the chance! I guarantee it is not a quick fix, but it is full of practical step by step tips on how to deep clean, and keep clean every room in the house. 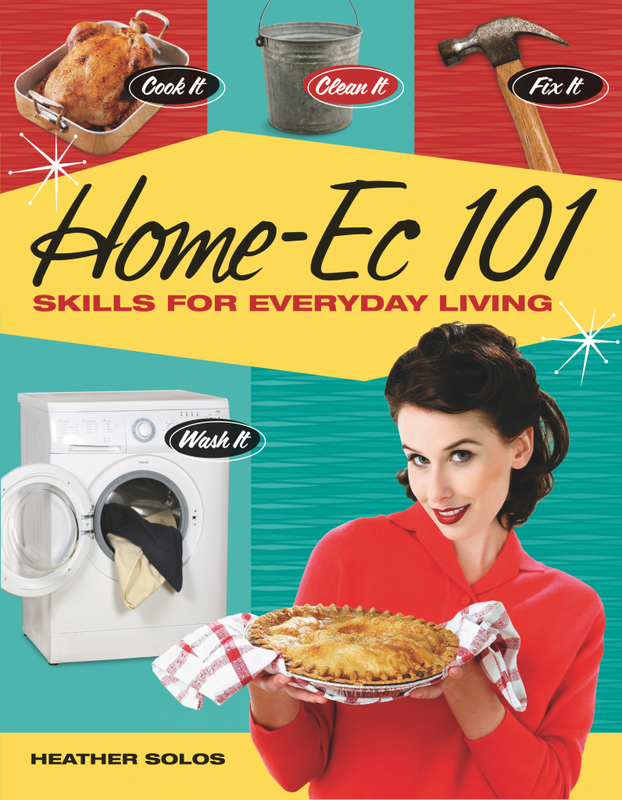 You can buy Home-Ec 101 on Amazon or at Barnes & Noble AND it’s available on E-Readers (like Kindle or Nook) so there really is no excuse not to have this information on hand (preaching to myself here). My version is electronic and the only downside is that it lacks all the pretty colors you see above! the design of the book still looks great and here you can see that while I am busy being distracted by a lack of colors, other people are CLEANING THEIR HOMES. So, lets get to the book shall we? You may or may not know that Heather runs a blog by the same name and she knows her stuff. She has answers to questions I never knew I had! For instance, did you know that if you use steel wool or strong abrasives to clean spots off your floor, it will actually cause scratches that will attract more dirt in the future? She knows that! She can also tell you how to get diarrhea stains out of carpet and just why you need dental floss if you really want a clean kitchen. This is powerful information. Granted, this isn’t necessarily the type of book one reads cover to cover, but Heather’s writing style and humor make it really hard to put down. Even if all I wanted to do was find out what solvent to use on my mini blinds. The other thing I want to point out is her weekly chores list. She breaks tasks down by day so you do a little bit at a time. It’s much less overwhelming and you can tailor it to your own schedule! I will tell you this, I am turning over a new leaf. We moved into a 40 year old house with 40 year old dirt and we NEED these tools. It’s time to get to the business of cleaning. And if I am honest? I am looking forward to it! Disclosure: I was given the opportunity to review this book free of charge through the One2One Network. All opinions expressed are my own. I really am bad at cleaning. That is all. Hey! Thank you so much for taking the time to review my book. As a first time author, it really means a lot to me. Thanks for stopping by! I am loving the book and yeah about that 40 year old dirt. You don’t even want to KNOW about our HVAC ducts. Other. Worldly.